The last few years have seen many examples of new or better technology focused on boosting highway safety. Collision avoidance systems, blind-spot detection and lane-departure warnings all support safe operation by our drivers. ELDs provide an additional tool that will further boost safety by ensuring that drivers will be well-rested and alert while behind the wheel on our increasingly congested roads. “Technology like ELDs helps KAG maintain our company-wide focus on creating the safest environment possible for our drivers and the public,” says Becky Perlaky, KAG Executive Vice President of Safety and Compliance. ELDs are additional roadside tools that provide accurate, consistent compliance with the hours-of-service regulations. In 2015, the Federal Motor Carrier Safety Administration published the final electronic logging device (ELD) rule, and gave carriers until December 18, 2017 to have ELDs in place. Attempts to delay enforcement of the rule failed, so all motor carriers that are required to maintain records of duty status must be ready with their ELD systems on Monday. It is important for shippers to confirm their current carriers will be ready with their ELDs. KAG is ready for the rule. If your carriers are not in compliance, consider KAG for moving your products safely and on time. 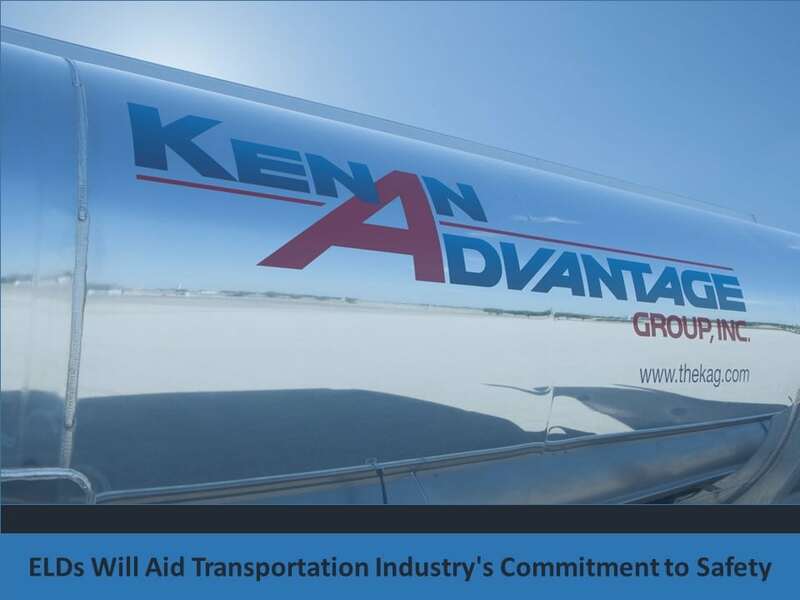 Kenan Advantage Group (KAG) is North America’s largest tank truck transporter and logistics provider, delivering fuel, chemicals, industrial gases, and food-grade products. KAG is the only independent fuels delivery carrier with a nationwide network, having operations in 40 states and the ability to deliver within all 48 states of the continental United States and Mexico. In addition, KAG operates in 16 Canadian locations throughout Alberta, British Columbia, Saskatchewan and Northwest Territories. KAG operates with the highest level of safety and security.